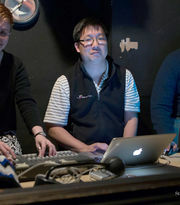 Michael Yew, in the tech booth for Charles Dickens Unleashed. Michael Yew is a photographer who has worked frequently with the Austin improv community, both photographing shows and shooting publicity photos, since 2010. Michael is also a technical improvisor for mainstage shows such as Strange Worlds. Michael is a real professional, and has delivered very successful projects in both US and Europe (London GB, Delft The Netherlands). This page was last modified on 2 December 2017, at 13:31.